Canadian’s often get a rough ride from their southern cousins – the South Park boys famously poked fun at this phenomena with their pant wittingly funny movie where Terrance and Philips’s fart jokes land the country in a world of hurt in which the only (apparently) logical answer is to blame Canada. As far as metal bands go, the recently revived and documentary spawning Anvil prove that there is more than enough durability and credibility to rubbish the inferior claims; whilst on the progressive front Voivod have for years proved that they are the equal of anything south of the border and it is only ignorance that would deny the success of bands like 3 Inches Of Blood, Devin Townsend, God Speed You Black Emperor and Priestess. 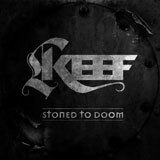 The doom and stoner genres are not one you’d immediately associate with the people famed for Mounties and saying ‘Aboot’ but Keef are here to prove that they can kick against the pricks and ‘Stoned To Doom’ sets out to do exactly that. The Invader swaggers out of the speakers with the confidence of a band who know their chops, riding on the crest of a huge riff all head banging, foot stomping, yet dazzling with off kilter harmonies and laid back cool – if there is any criticism here it’s that it is gone as soon as it arrives. Evil Dread follows hot on it’s heel with a similar vein but manages to capture a Black Sabbath Vol 4 cool that drips with melody and warm vocal harmonies that frankly should see fans of either the stoner or doom genres creaming themselves. Yes it is accessible and catchy, but that is purely because these dudes seem to know how to marry heavy passages with beautiful guitar that soars and reaches right to your core. The song titles at times leave little to the imagination ‘White Widow’ and ‘The Green Shade’ are nothing you wouldn’t expect from a band who share their name with the slag for THC crystals from cannabis buds, but that description does them a slight disservice as there is a skill and a passion that ranks them higher (pardon the pun) than the average dopesmoker endlessly jamming the same riff in some dank garage – These guys have the ability to break up the state of play with some serious song writing onus. The main body of influence is clearly Black Sabbath and there are parts on this album that sound as focused as Iommi and co would haven been if not Scarface deep in a nosebag of coke. Gregory Cochrane’s vocals manage to combine the old school feel (I can’t believe I am describing them as ‘old school’ now) of John Garcia when fronting Kyuss and the modern rock stylings of their fellow countrymen Priestess. A large part of their musical success lies in the fantastic interplay between the solid as granite rhythm section of John Kendrick and Ilios Steryannis at times they are all experimental and space rock infused jam and then they break through with a Symptom of the Universe-esque powerful driving rockathon. To focus on the negative for a moment, it is that at times ‘Stoned To Doom’ is a little samey and criminally short. I like to blaze it up and lose myself in a track that goes on for years before yanking me out of the musical journey, where as ‘Stoned To Doom’ is at times like an amuse-bouche, in that it wets the palette but leaves you wanting more. Sure the production isn’t the best and in an ideal world you want the bass to shake your chest and the drums to rattle your spleen but then again have you heard St Anger? This is a promising album from a band brimming with ideas and is essential listening and one to watch for fans of Goatsnake, Black Sabbath and Kyuss. PsycheDOOMelic have unearthed a hidden gem here, or is it a tasty bud of weed down the side of the sofa? DENOVALI RECORDS: Birds Of Passage New Album & 10"